The legendary Pat O’Brien’s Bar in the French Quarter, New Orleans. Opened its doors on December 3, 1933, two days before the end of Prohibition (well, ya had to have a coupla days to get ready). As the story goes, back in the 1940s the bar’s partners Benson “Pat” O’Brien and Charlie Cantrell were forced by liquor wholesalers to order as many as 50 cases of rum along with whatever other spirits they wanted, or else no deal. There was a glut of rum post-Prohibition and the dealers wanted to move it. Problem was, Pat and Charlie couldn’t care less about it. What the hell are we going to do with all this rum?! Their solution — create a drink to use up all this rum. After some tinkering they wound up with a powerful mixture of rum, passion fruit syrup and fresh lemon juice and created a taste sensation. Pat O’Brien’s is quite possibly the most popular bar in the French Quarter, certainly among tourists — (a Times-Picayune article on the history of the place from a couple of years ago said that 95% of all first-time New Orleans tourists go there. You’ll even sometimes see some locals in there, although probably not so much as in older days. The Main Bar and Piano Bar in the front were once popular haunts for locals, and the Courtyard Bar, with its flaming fountain, is one of the most beautiful bar spaces in the city, and you should really go see it if you haven’t … as long as you don’t mind sharing the space with loud tourists and Texas frat boys. There’s just one little problem — the drinks are pretty terrible. Oh, you can get some okay mixed drinks there, but … well, Pat O’Brien’s put me off Mint Juleps for years because I made the mistake of ordering my first one there. I got a bright green concoction made with mint syrup and not a speck of fresh mint other than a wilted garnish that looked and tasted like Scope, and the bartender actually mocked me when he served it to me. 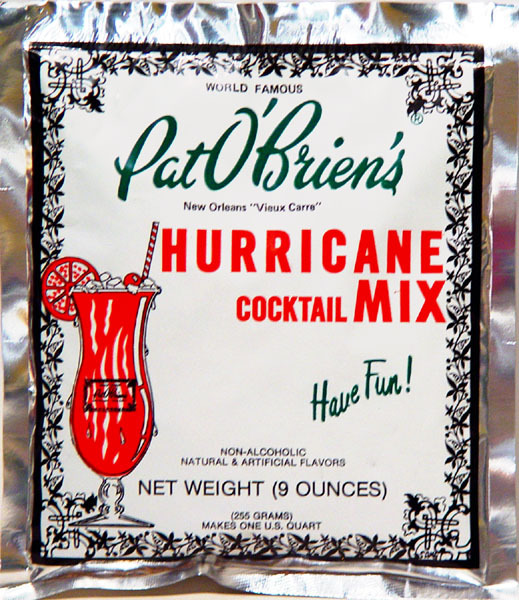 Regarding the Hurricane as currently served at Pat O’Brien’s, I have one word for you: sweet sweet sweet Sweet SWEET! (Okay, one word five times.) Rum? Oh yes, and lots of it, four whole ounces per drink. 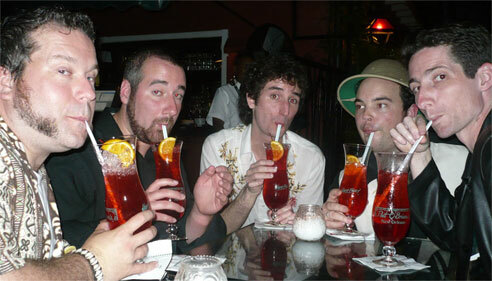 They go through a lot of it; it’s said that Pat O’s is the single largest purveyor of rum in the world. Passion fruit? Um … not so much. I’d say that flavor is undetectable in the drink. Lemon juice? Zilch. There is no balance of tart in this drink. Did I mention that it’s SWEET? Teeth-shatteringly sweet. “A stealthy drink” is how my friend Chris Clarke once described it, and that it is. It’s like an alcoholic kool-aid in which you cannot taste the alcohol. And you can forget about any fresh ingredients — the recipe at the bar is rum (I don’t know which one they use in their well) plus “Hurricane mix,” which at the bar is a premade, artificially colored, artificially flavored bottled red stuff, which is also available in envelopes in powder form. If you’re serious about cocktails, this isn’t anything you really want to be drinking. In fact, in a post from Tales of the Cocktail’s weblog a while back, the Hurricane was listed as one of the worst drinks on Bourbon Street (then again, can you get a good drink on Bourbon Street anywhere past Galatoire’s?). Research for this post resulted in a highly amusing photo of a bunch of cocktail bloggers sucking down their Hurricanes like mother’s milk. I don’t know when Hurricanes stopped using passion fruit syrup and citrus and when they started being red, but if you look at the list of ingredients — rum, passion fruit syrup and lemon juice — you don’t see anything red in there. Perhaps someone dumped grenadine in it once, and that evolved into the syrup … I really don’t know. If you do, let me know. 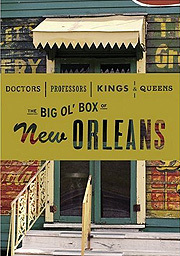 When I was in college, having just moved to Los Angeles from New Orleans, I was really homesick and didn’t know a damn thing about proper drinking. My homesickness caused me to bring back many envelopes of that awful powder and throw “Hurricane Parties,” the object of which was to socialize and get stinking drunk. (To be honest, we did have a great time, even though after the first round or two I stopped using “the good rum,” i.e. Bacardi, ahem, and started mixing them with plain wrap rum that was probably a step above tiki torch fuel.) If I didn’t have the powder, I used a a “faux-Hurricane” recipe that I found in an old local cookbook called La Belle Créole calling for a mix made with 46 ounces of Fruit Juicy Red Hawaiian Punch (back in the olden days, that was “one large can”), one 12-oz. can of frozen orange juice concentrate, and one 6-oz. can of frozen lime daiquiri mix. Though it didn’t taste all that much like the Hurricanes served at Pat O’s it was fruity, red, and we were too drunk to be able to tell the difference anyway. Shake with ice and strain into an ice-filled Hurricane glass or tiki glass. Garnish with a “flag” made of an orange slice and a cherry on a cocktail pick. This is still a bit sweet but not nearly as sweet as the Pat O’Brien’s premix Hurricane, and it’s all fresh and not artificial. Oh, and don’t skimp on the passion fruit syrup, either for the above variation or the real thing below. The go-to passion fruit syrup for years has been Trader Vic’s, but it has been reformulated with artificial ingredients and is no longer acceptable. You can get passion fruit syrup from Monin or Torani, opinions of which range from decent to acceptable to yuck, but you’ll really want to go to Aunty Lilikoi from Hawaii and order the best in the world. Seriously, it’s an order of magnitude or two better than the aforementioned ones. As I understand it the original drink was made with lemon juice. If you’re a stickler for history and if you prefer it that way, use freshly squeezed lemon juice and you’ll be drinking some true New Orleans history. However, I think that lime works so much better and so perfectly in this drink that at home we make it with lime juice. Try it both ways and see which one you prefer. This is for a reasonably-sized drink, not the super-sized one you typically see; unless I’m seriously getting my tiki on, perhaps quaffing at Tiki Ti when someone else is driving, the original proportions might be a bit much. That proportion called for four ounces of spirit, and two ounces of each of the other ingredients. If you want a big one served in a hurricane glass, just double this recipe, then prepare for blottofication. Combine rum, syrup and juice with ice and shake vigorously until the mixing tin frosts. 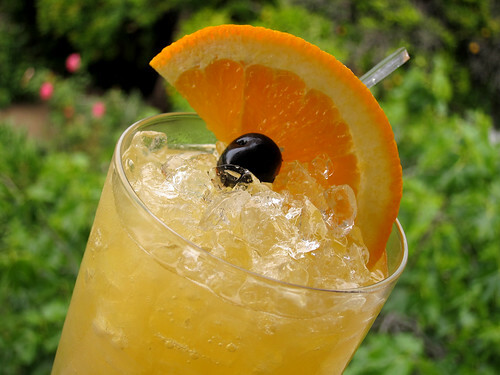 Serve in a double Old Fashioned glass or tiki glass over crushed ice, and garnish with an orange and cherry "flag." Now THAT’S a Hurricane, brah. You really had to post that picture again, didn’t you? A real Hurricane is a great cocktail though. Rick — Sorry, buddy. It’s just too funny! Hey, did anybody get a shot of y’all drinking Hand Grenades™? Tiare — It sure is … light-years better than the fake red fruit punch. Every time I see this picture I can’t help but to wonder who (if anyone) finished their drinks that night. I´m sure at least one of them did, but I guess none will ever admit it. When I had my “experience” w/ the “Original” Hurricane at Pat O Brian´s all I could think was “this is jelly powder and booze, can I get my money back now?”! There’s something magic about this that always wins over the “I can’t drink anything but vodka” crowd. Lord knows why–it sure tastes like rum to me. I make my passion fruit syrup the Jeff Berry way, by thawing a packet of Goya passion fruit pulp and mixing it with an equal amount of simple syrup. It ain’t Aunty’s, but it’s a heckuva lot cheaper, and it works fine for tiki drinks. Oh, and I’d love to make my syrup the Jeff Berry way, but I still can’t find Goya passion fruit pulp anywhere near me. Aunty’s is the best, but it ain’t cheap. I then put a large straw in and pour 2 oz. dark rum into the straw so that they love/hate their first sip. It’s a little expensive though – 10 bucks. How much is Pat O’s? Shake all ingredients with ice, then strain into a goblet or collins glass filled with ice. All ice should be large cubes. Garnish with an Orange Wheel and Maraschino Cherry. Don’t know who you are love the photo! Thanks for sharing this recipe! As a local, as you know, Pat O`s is the last place any of us go, for the exception of Hustlers. This is the closest recipe, if not THE recipe, I have ever had to Great Hurricane`s you can get around our beautiful city at a “few” bars. Every year, I mail/fedx/ups tons of King Cakes and packets of that powder stuff to family and friends all over the country. Next year, I`m skipping the packets and sending your recipe! Thanks!! DITTO on your entire first experience at Pat O’s. I ALSO had the mint julep and I did not try another one for FIVE YEARS…..it was my first trip to NOLA and I could not for the life of me understand why someone would drink these, until I finally got up the courage to try another (not at Pat O’s). Why do we first timers put ourselves through the misery?? And DITTO on the powdered mix and the parties…wow there must be a ton of us out there. Thank goodness we all grew up. 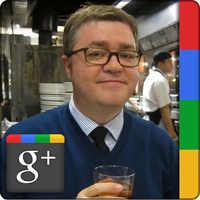 Cocktail Buzz – we did the exact same thing last year during Hurricane Irene! Made some of the modified version Hurricanes (with the grenadine) and weathered the storm in Brooklyn. One thing we discovered when I made one for my friend who “can’t drink rum”: this version of the Hurricane works DELICIOUSLY when made with tequila. I subbed 1.5 oz. blanco for the white rum, and 1.5 oz. reposado for the dark rum. Kept the grenadine, OJ, lime, and passion fruit equal. I actually liked this more than the rum hurricane!